Blue Cohosh is a leafy shrub that was highly esteemed by the Amerindians, used traditionally to aid in labour, correct heavy menstruation, and treat abdominal as well as urinary conditions. The root portion also has potential as a contraceptive on account of its estrogenic properties. 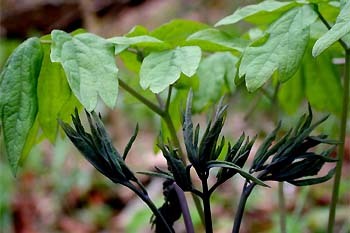 Blue cohosh is native to Eastern, Central and North American woodlands, where it is found growing with glossy green or purplish leaves, unremarkable flowers, and bright blue berries. Berry seeds may be roasted and used as a coffee substitute. Prefers full or part shade, and with care you will have flowers within 4 years. Once roots have established, do not relocate. Rhizomes spread to foster new growth. Height 12-24in (30-60cm); Spread 6-12in (15-30cm).